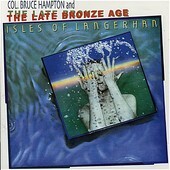 Rustic Americana-rock with all the heart and soul in the world and Col. Bruce Hampton and the Late Bronze Age's Isles of Langerhan can't bolster an albums worth of worthwhile material. Here we have a fun-time, loose, childish hootenanny of sloppy, carefree Americana. The idea is nice, but the end result leaves so much to be desired. I'll give it a C-.